Very impressive links on Hyper-V Resource Control and Resource Metering. Hyper-V Resource Metering in Windows Server 2012 allows organizations to avoid the expense and complexity associated with building in-house metering solutions to track usage within specific business units. It enables hosting providers to quickly and cost-efficiently create a more advanced, reliable, usage-based billing solution that adjusts to the provider’s business model and strategy. Hi, I’m Lalithra Fernando, a program manager on the Hyper-V team, working in various areas including clustering and authorization, as well as with our Hyper-V MVPs. In this post, I’ll be talking about resource metering, a new feature in Hyper-V in Windows Server 2012. As you’ve probably heard by now, Windows Server 2012 is a great platform for the private cloud. When we began planning this release, we realized that one of the things you need in order to run a cloud is to be able to charge your users for the resources they use. This is the need resource metering fills. It allows you to measure the resource utilization of your virtual machines. You can use this information as a platform for your own dynamic chargeback solutions, where you can charge customers based on the resources they use instead of a flat upfront cost, or to plan your hosting capacity appropriately. There are four resources that you can measure: your CPU, memory, network, and storage utilization. We measure these resources over the period of time between when you measure and when you last reset metering. CPU (MHz): We report the average utilization in megahertz. Now, you’re probably wondering why we don’t report this as a percentage. After all, that’s what we do in Hyper-V Manager. Well, we know that you like to move your virtual machines. With Windows Server 2012, you can live migrate your virtual machines all over the place. Naturally, the record of how much resources your virtual machine has used moves with it. We want the virtual machine’s CPU utilization to make sense across multiple machines. If we report a percentage and you move the virtual machine to a host with different processing capabilities, it’s no longer clear what the percentage refers to. Instead, we report in megahertz. For example, if your virtual machine had an average CPU utilization of 50% over the past billing cycle on a host with a CPU running at 3GHz, we would report 1500MHz. Here I am converting the CPU capacity from GHz to MHz and figuring out how much of that capacity was used over each hour. 2250MHz-Hr / 2 Hours = 1125 MHz. Then, I simply divide over the two hours to get this value. One final note: we don’t report minimum and maximum utilization values for CPU. If you think on it a moment, you’ll come to the same realization we did: it is very likely that the minimum will be 0 and the maximum will be the full capacity of the hosts’ CPU at some point over the timespan you’re measuring. Since that’s not very useful, we don’t report it. Memory (MB): We report the average, maximum, and minimum utilization here, in megabytes. The minimum memory utilization captures the least memory used over the timespan measured. Since it’s not very useful to know that the minimum memory usage was zero if the virtual machine was ever turned off, we only look at the minimum memory utilization when the virtual machine is running. We do include the offline time of the virtual machine when calculating the average memory utilization. This provides an accurate view of how much memory the virtual machine was using over that billing cycle, so that you can charge your users accurately. Network (MB): We report network utilization in megabytes. Of course, we want this metric to be useful, so we considered how you would want to see this information broken down. One way you might want to distinguish between network traffic is to see how much traffic is inbound to the virtual machine, and how much is outbound. The most important breakdown you will want is how much traffic does the virtual machine send or receive from the internet, which costs you money, and how much is just communication between virtual machines you host, which costs you nothing since it is just using your intranet. With this breakdown, you can charge your user accurately for their internet usage. These ACLs are used for more than just resource metering; note the Allow and Deny actions. For our purposes, you set the action to “Meter”. Enabling resource metering creates two sets of default metering ACLs, provided none are already configured. The first set of ACLs, one inbound and one outbound, has a remote IP address of *. *; this wildcard notation indicates that it will meter all IPv4 traffic that is not covered by another ACL. The second set has an IP address of *:*, which meters all IPv6 traffic. With these metering ACLs, you can measure the total network traffic sent and received by the virtual machine, in megabytes. You can configure your own ACLs to count intranet traffic separately from internet traffic, and charge accordingly. Disk (MB): As we spoke with customers, we realized that for chargeback purposes, they were only interested in the total disk allocation for a virtual machine. So, here we report that in megabytes. Pass-through disks, DAS disks, guest iSCSI connections, and virtual Fibre Channel disks are not included in the total disk allocation metric. Once you enable resource metering, Hyper-V will begin collecting data. You can reset metering at any time. We will then discard the data we have collected up to that point and start fresh. So, you will typically measure the utilization first, and then reset. When you measure, you are measuring the utilization over the timespan since you last reset metering. Metering is designed to collect this data over long periods of time. If you need greater granularity, you can look at performance counters. Having resource metering enabled and just capturing utilization data per your billing cycle has no noticeable performance impact. There will be some negligible disk and CPU activity as data is written to the configuration file. You can try this all out for yourself now, with Windows Server 2012. In the next part, we’ll talk about how to actually use resource metering with our PowerShell cmdlets. We hope this is useful for you. Please let us know how you’re using it! Thanks! Windows Server 2012 Hyper-V contains a resource metering mechanism that makes it possible to track system resource usage either for a virtual machine or for a collection of virtual machines. Doing so can help you to keep track of the resources consumed by virtual machine collections. This information could be used to facilitate chargebacks (although Hyper-V does not contain a native chargeback mechanism). As you look at the command above, you will notice that the collection frequency is being set at the host server level. You cannot adjust the frequency on a per VM basis. You can see what this command looks like in figure 1. [Click on image for larger view. ]Figure 1. You can change the resource metering collection frequency. This command will display all of the available metering data for the virtual machine that you have specified. You can see what the output looks like in figure 2. [Click on image for larger view. ]Figure 2. This is what the resource metering output looks like. Often times administrators are interested in specific aspects of resource consumption. For example, if a particular host server had limited network bandwidth available then an administrator would probably be interested in seeing the amount of network traffic that each virtual machine was sending and receiving. Conversely, if that same server had far more processing power than what would ever be needed by the virtual machines that are running on it, then the administrator probably would not need to monitor the average CPU usage. 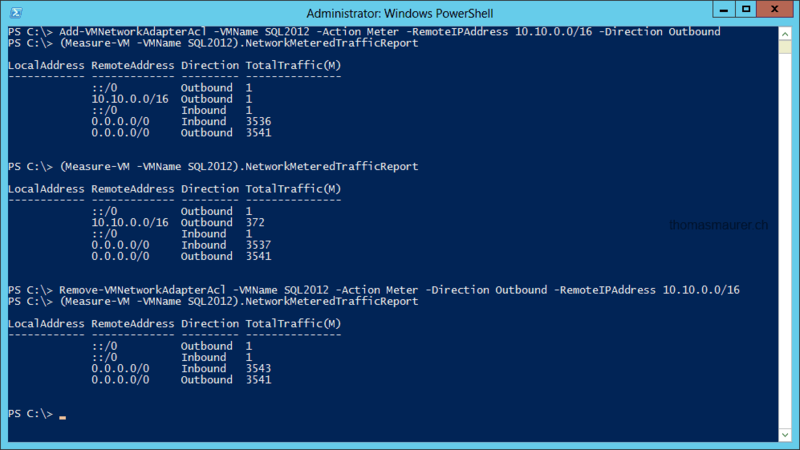 The column on the left side of the output lists the names that PowerShell uses for the individual statistics. You can see what this looks like in figure 3. [Click on image for larger view. ]Figure 3. You can get the object names from the column on the left. There are a couple of things that you might have noticed in the figure above. First, there are more objects than what are displayed by default. Second, there are more objects than what I listed earlier. The reason for this is that these screen captures came from a server running Windows Server 2012 R2 Preview. Microsoft is extending the Resource Metering feature in Hyper-V 2012 R2 to include additional metering objects. In this article however, I only listed the objects that are available today. You can see the output in figure 4. Keep in mind that you can adapt this command to display any combination of objects that you want. [Click on image for larger view. ]Figure 4. 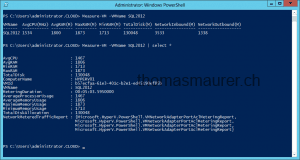 PowerShell can display specific resource metering data. As you can see, resource metering is useful for tracking resource consumption. It can also be useful for performing chargebacks, although there is no native Hyper-V chargeback mechanism. IT Professionals need tools to track usage from specific business units. If you search you can find lot of monitoring tolls that can do this job but most of them need to pay and for free open source need an advance knowledge to install, configure and enable measure metrics for the resources that you want. I don’t want to say don’t use Monitoring Tool in your enviroment. But it takes times and need people to do this. If you are alone you need a quick solution until decide your Monitoring Solution in your enviroment. So today in this article i will show you another feature that was introduced in Windows Server 2012 Hyper-V that isn’t immediately obvious and is driven by using Windows PowerShell. I will explain only basic commands that can use it every day to measure metrics of your VM’S. The feature is amazing and it’s sure that i will come back with more advance commands of Resource Metering. Let’s start to explain with practise. As usuall open a Powershell as Administrator always. Let’s see more details for the VM. This is my last article for the 2015. I will come back with new Articles and Tutorials in 2016. With Windows Server 2012 Hyper-V Microsoft introduced a new feature in Hyper-V called Resource Metering which allows you to measure the usage of a virtual machine. This allows you to track CPU, Memory, Disk and network usage. This is a great feature especially if you need to do charge back or maybe even for trouble shooting. Last week I had the chance to test and implement this feature for a customer. First you can check the available PowerShell cmdlets for Hyper-V or for the the commands which include VMResourceMetering. The resource metering has to be enabled per Virtual Machine. 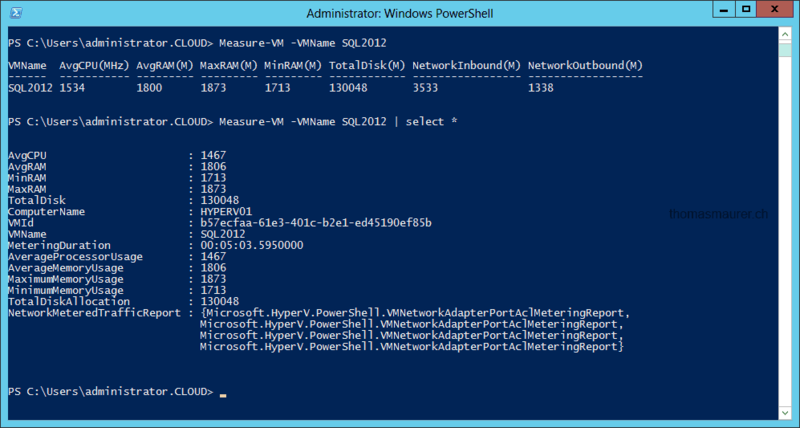 This is great, so even if you move the virtual machine from one Hyper-V host to another you still have the usage data. To enable the resource metering you can use the following cmdlet. In my case I enable VM Resource Metering for my VM called SQL2012. With the cmdlet Measure-VM you can get the statistic for the VM. 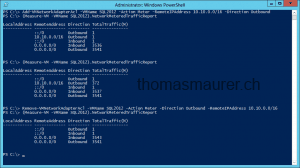 To get the network traffic use the properties of the NetworkMeteredTrafficReport. Here is another great thing, if you want to measure Network from or to a specific network you can use VM Network Adapter ACLs to do so. With ACLs you can not just allow or deny network traffic, you can also meter network traffic for a special subnet or IP address. Of course you can reset the statistics for the VM. I think this is one of the great new features of Windows Server 2012 Hyper-V which gets not a lot of attention but is really important.